A special thank you to the Selection Committee for their work selecting this year’s class! The committee consisted of Tom Lewis, Carl Del Corral, Alex Ingerman, Ed Jarus, and Jeff Zabukovec. John was inducted for his contributions to GCSOA as a referee, mentor, and instructor. John officially became a referee in 1980. 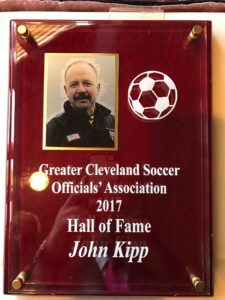 Experiencing wild success across the board on the field since becoming a high school referee in 1983, including 8 OHSAA State Championships, John took his talents to the collegiate level and to the classroom. John became a college referee in 1986 and has officiated many NCAA tournament games over his career. John is still a National Instructor and Staff Clinician for NISOA, and is an instructor for OHSAA, where he has taught classes and meetings for many years. John continues to spearhead high school instruction for GCSOA, including coordination with OHSAA. 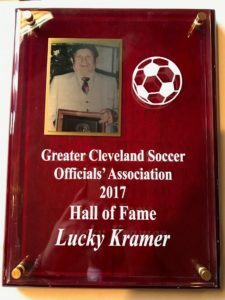 Lucky was inducted for his contributions to GCSOA as a referee, mentor, assignor, and Founder of GCSOA. Lucky was a former professional soccer player in Europe who immigrated to the US in 1948 where he took up officiating. Lucky was both a high school and college referee during his career. Lucky, with the help of Ray Priestley, founded GCSOA in 1974. Lucky laid an incredibly solid foundation and path for Cleveland area referees to follow. 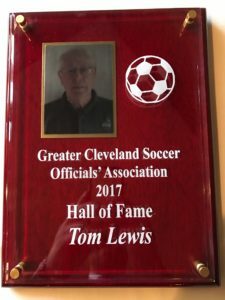 Tom was inducted for his contributions to GCSOA as a referee, former Board Member, assignor, instructor, and assessor. Tom became a high school referee in 1973, making him one of the longest tenured officials in Ohio. In 1985, Tom became Secretary for the GCSOA board, a position he held until 1994. In 1994, Tom became an assignor for the OHSAA playoffs for the NE district- a position he still holds today. Tom has also been an OHSAA instructor since 1994. Tom is also credited with multiple NFHS and OHSAA rule changes over his career. 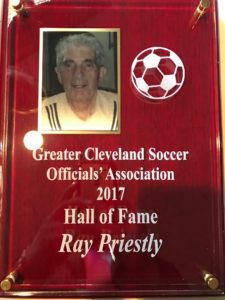 Ray was inducted for his contributions to GCSOA as a referee, mentor and Founder of GCSOA. Ray became a high school referee in the early 1970s. Ray was recognized for his successes on and off the field by GCSOA in 1977 with an Outstanding Achievement Award. Ray’s work and leadership has allowed GCSOA members to carry a prestigious reputation around the state from the day the association was founded. Andrew was inducted for his contributions to GCSOA as a referee, mentor, and former Board President. Andrew became a high school referee in 1979 and worked 2 State Championships and 2 semi-finals during his career. In 1981, Andrew became Board President, a position he held until 1983. In addition to high school, Andrew also refereed the MISL and for NISOA. Andrew is currently President of the LESL, a position he also held in 1976. 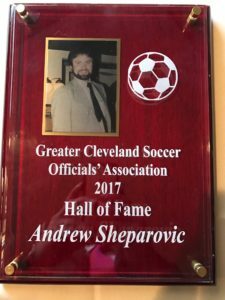 Andrew also started the Parma Recreation Soccer program in 1984, as well as the high school program in 1987. 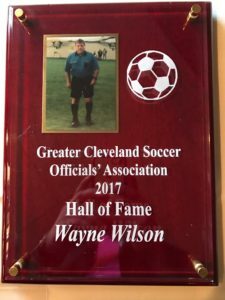 Wayne was inducted for his contributions to GCSOA as a referee, assignor, former Board President and Vice President, committee member and mentor. Wayne was a high school referee for 31 years refereeing numerous playoff games. Wayne served as the recruitment director from 1988-1990, was on various boards and committees for GCSOA from 1990-2002, was President and Vice President 3 times each from 2002-2014, and has been assigning games for GCSOA for years. Wayne’s countless hours and dedication in meeting rooms, on the field, and in front of a computer screen are a huge reason officials for GCSOA have had the successes they have had in their careers.